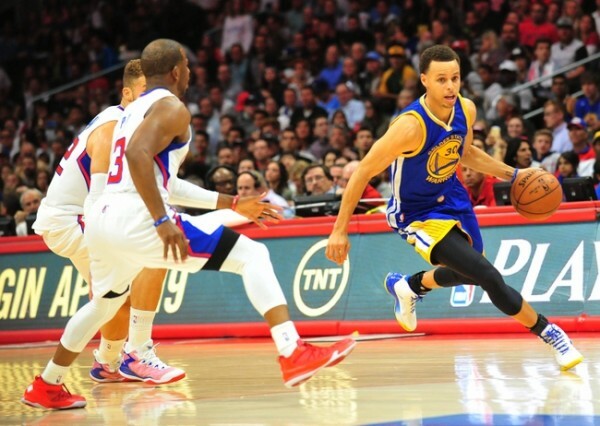 While the Internet salivates all over Stephen Curry dropping Chris Paul to the floor in another astonishing display of dribbling skills, the important thing to take from this game happens to be the Golden State Warriors beating the Los Angeles Clippers 110-106. The Clippers can feel a little bit angry with the officials for awards Andre Iguodala with 3 shots from the line that helped seal the game. Iguodala air-balled a 3-pointer but a slight touch from Matt Barnes as Iguodala had already hit the ground resulted in a foul call which Iguodala made the most of, making all three free throw attempts to give the Warriors a 106-102 lead with 1:10 remaining in the game. But the thing everyone is going to be talking about will be Stephen Curry. He didn’t outplay Chris Paul. They both scored 27 points, and the Clippers actually were winning by four points during Paul’s minutes, while the Warriors were down by one when Curry was playing. However, that one second of incredible crossover sealed the fate of what we’ll think about when thinking about this game and the rivalry between the two teams. And there were also the MVP chants that Curry was hearing as he went to the free throw line. Remember, this game was played at the Staples Center. Blake Griffin made an interesting comment after the game. He had one heck of a performance with 40 points, although just 6 of them came in the fourth quarter, but Griffin talked about the home court advantage the Clippers won’t have in the playoffs. Right now, it seems like they’re missing every opportunity to get it, tied with the Blazers in games behind but having played two games more (49-26 to 48-25) while the Spurs at 48-26 are closing fast from behind. This was another game in which the Warriors, via Andrew Bogut especially, managed to make DeAndre Jordan look very bad. He is shooting over 70% from the field this season and is about to set the second highest field goal percentage in NBA history along with the second-worst free throw shooting percentage, but Bogut constantly is capable of making the paint feel like a nightmare for him. And when looking at more ways to compare these two teams, it’s the bench. The Clippers might have a starting five that can keep up with anyone in the league, but with Doc Rivers letting his son play too many minutes and helping him stay in the league he’s hurting his own team and his own job. The Warriors have Iguodala, Barbosa and Speights coming off the bench. Players who make a difference, maybe even made the difference in this game. And finally, as for Curry winning the MVP? He’ll be the winner with the least amount of minutes per game if he does win. But he doesn’t deserve it. He’s not the best player in the league this season, and isn’t the most valuable to his team. He’s the best player on the best team, which is the worst way to select the recipient of the award, but voters sometimes have a very special kind of logic they follow, which might make him the undeserving winner eventually.